John has struggled with anxiety and depression most of his adult life, yet he always felt he could cope with it on his own. That changed when his girlfriend of 20 years passed away. Now the 57-year-old is getting help for his disease at Touchstone Mental Health’s intensive residential treatment facility in Minneapolis. A soft-spoken man with striking blue eyes and a coy smile, John said that today he’s feeling good, and admits one of the things he enjoys most in treatment, as in life, is eating. While John’s favorite meals are lasagna, chicken alfredo and bacon and eggs, he said that with the help of Touchstone, he’s trying to incorporate more fruits and vegetables into his diet. He knows it’s important to his health. To what extent diet impacts mental health is still being studied, but there is growing evidence to suggest that a diet high in fruits, vegetables, whole grains, fish and low-fat dairy reduces the risk of depression. Chris Hughs, program supervisor at Touchstone Mental Health, believes that an integrative, holistic approach to care supports a healthy mind, body and spirit. 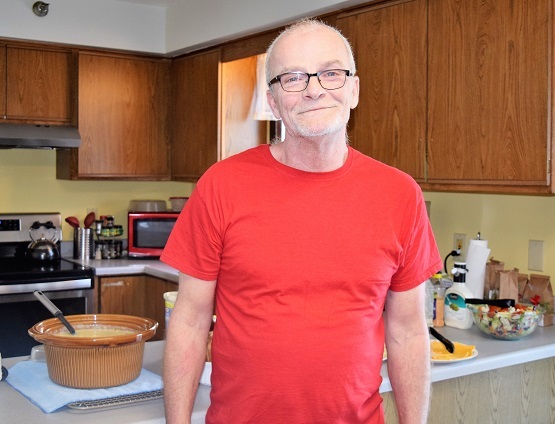 It’s why Hughs and his staff make it a priority to provide fresh, healthy meals for John and the other 13 residents currently in treatment at the house. At Touchstone, patients are assessed by a nurse upon admission. They are asked about their dietary preferences, and if they are a vegan or vegetarian their meals will be planned accordingly. But Hughs admits that healthy food isn’t always an easy sell. Much of the food served at the residential treatment facility comes from Second Harvest Heartland through Loaves & Fishes food redistribution program, which serves as a hub for smaller meal programs like Touchstone’s. The program offers big cost savings compared to retail, the freedom to order smaller amounts of food and access to a wider variety of food, including farm-fresh produce. Scott Rolfs has been a chef at Touchstone Mental Health for just over two years. In addition to cooking all the meals, which he serves family style to residents, he’s also in charge of shopping for food, budgeting and menu planning. Rolfs said he likes to plan his meals a month in advance.